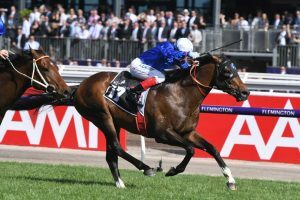 A big day for James Cummings and Godolphin was capped off with a Best of Days win in the Group 1 Kennedy Mile at Flemington on Saturday. Best of Days, who won the Group 3 Coongy Cup (2000m) at Caulfield last month, was a class above in the final stages, challenging Le Romain in a race toward’s the line to secure Craig Williams his 53rd Group 1 win. Best of Days, above, claimed a maiden Group 1 win in the 2018 Kennedy Mile at Flemington on Saturday. “They’ve put the blinkers on today, and it worked out really well, just love the way he ate the line up” Williams said after the race. Best of Days entered at $13.00 odds with Ladbrokes with the majority of the money coming for the four Darren Weir runners – in particular, Land of Plenty. The British import made full use of barrier one, darting along the inside to take Le Romain to the sword. “Craig delivered a copy book ride, from admittedly a beautiful gate” Cummings said following the win. Best of Days stole the victory at the finish line to win by a nose, and has since firmed from $21 into $10 ahead of the Group 1 Railway Stakes (1600m) in Perth later this month. The decision to run with the blinkers on proved smart from Cummings, which more or less made the difference down the straight. “He had just galloped better than he had galloped all preparation, I was very confident the horse was capable of running well” Cummings said when asked about the decision to race with the blinkers on. Cummings was also impressed with the run of Kris Lees’ six-year old. “Le Romain, full credit to that horse carrying a big weight, he looked outstanding, he brought The Everest form here and our horse Best of Days was able to outmuscle him. The win made it 29 Group 1 victories for Godolphin around the world this year, in what has been a successful 2018 for the blue colours.